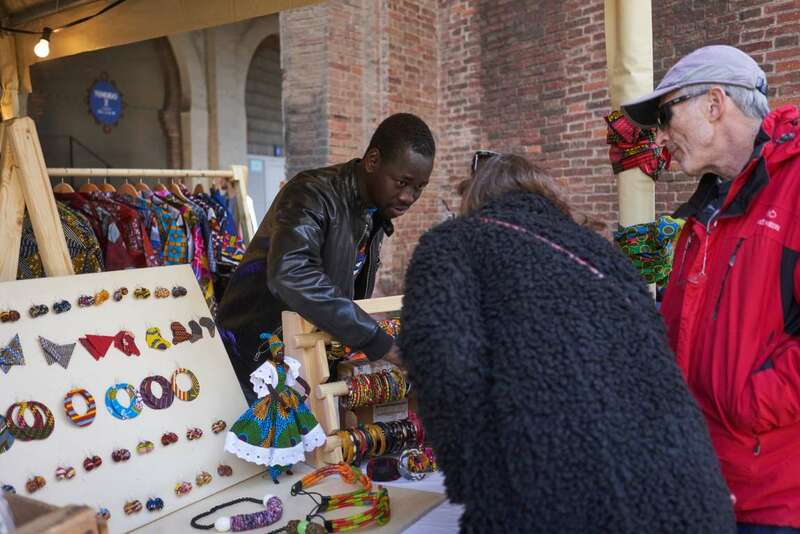 Babacar Diop, from Senegal, selling goods as part of Barcelona’s cooperative project to get migrant vendors to operate from official handicraft markets. On sunny weekends, dozens of sidewalk vendors line up along the seafront promenade in Barcelona, offering wares like purportedly designer-name sunglasses, clothing and other knickknacks, usually counterfeit. The vendors, known as manteros, epitomize a quandary facing the authorities: It is one thing to debate whether to allow more migrants into the European Union, but quite another to agree on what to do with them once they arrive. Most manteros are migrants from Africa who have often risked their lives fleeing violence or poverty. But many find when they reach the European Union that landing a regular job without the correct papers is almost impossible — especially in high-unemployment countries like Spain. To make a living, many join the growing ranks of street sellers. Barcelona has become a hub for manteros, or blanketeers, so called for their practice of spreading their goods on cloth sheets that can easily be folded into a makeshift bag. The street vendors, who often approach tourists on the city’s beaches or promenades, have become an increasingly hot-button topic in Spain, and episodes involving manteros have occasionally turned violent. In recent weeks, a court sentenced a mantero to four and a half months in prison and a fine of 3,500 euros, about $4,000, for injuring a police officer during a check in Cambrils, a resort south of Barcelona. The mantero repeatedly kicked the officer, who had put his foot on the merchandise cloth to stop the vendor from running away. Also last month, an American tourist, José Bravo, was hospitalized in Barcelona with head injuries after he said he was attacked during a tussle with a street vendor. The manteros say they are being used as a political football, and have pointed to police excesses. A union formed by the vendors recently called on the authorities to decriminalize their street selling activities. Vendors have clashed with the authorities elsewhere in Spain, including in Madrid in March, when protests prompted by the death from a heart attack of a Senegalese vendor during a police check turned violent. Leading up to municipal elections in Barcelona and other cities next year, opposition politicians have used the tensions over the manteros to accuse Barcelona’s leftist mayor, Ada Colau, of failing to maintain law and order in the city. The street vendors have found Barcelona to be a relatively good base, largely because the city has plenty of tourists willing to buy counterfeit sunglasses and bags. But many people oppose the sellers’ presence; shopkeepers express particular frustration, saying the manteros are drawing away customers. “It’s just horrible to have this illegal competition,” said Carlos Servidio, whose market stand offers leather belts and bags manufactured at his workshop in Rubí, a town just outside Barcelona. Born in Argentina, Mr. Servidio arrived in Barcelona 30 years ago. The police and other authorities have blamed each other for allowing street vending to spiral. In August, a labor union representing Barcelona’s police force accused Ms. Colau’s administration of warning manteros about upcoming raids. No one knows for sure how big Barcelona’s network of manteros is. Estimates vary from a few hundred to almost 3,000, according to an association of shopkeepers that was formed to protest illegal street vending. City Hall said it had no official data. Street vendors who operate illegally can face prison if caught repeatedly, but an opinion poll published in April by the newspaper El Mundo suggested that most Spaniards want the police to fine manteros rather than detain them. In July, the left-wing mayor of Madrid, Manuela Carmena, introduced a residency permit for undocumented migrants that offers access to health care and some other basic public services. Opposition politicians have warned that such moves could encourage more illegal migration and exacerbate the mantero problem, but Ms. Carmena has said that the street vendors should not be ostracized. “Madrid is a very large city where there are irregular activities that shouldn’t take place, but the fact that there is a certain number of people selling irregularly is by a long shot not among the main problems,” she told reporters last month. Barcelona introduced a cooperative project last year aimed at helping vendors leave the streets and sell items at official handicraft markets instead. The project is intended to let vendors earn money and eventually obtain work permits. Babacar Diop, from Senegal, was among the 15 vendors selected to begin the cooperative. Having reached Spain a decade ago, he turned to street vending after bouncing for several years between occasional odd jobs, including working as a security guard on a construction site. In the Barcelona district of San Roque, dozens of undocumented migrants live in an abandoned factory, sleeping on mattresses around wooden stoves to keep warm. New arrivals who turn to street vending in Barcelona normally start out with help from an established mantero. The contact usually lends enough money to buy counterfeit merchandise from one of the warehouses in the nearby city of Badalona. One recent evening, Samba Diallo, 28, ventured out to sell his goods in central Barcelona. Threading his way between tables on a cafe terrace, he held two wooden sculptures of elephants and a large cloth bag over his shoulder filled with bracelets and other trinkets. He headed for a table occupied by three elegantly dressed women; when they saw him approach, two clutched their handbags and waved him off. At another table, Mr. Diallo struck up a conversation with a Dutch family and got the father to hold his elephant sculpture and have his photograph taken alongside him. The Dutch tourist later explained that he had liked the elephant but worried about buying the bulky object because of luggage restrictions on his low-cost airline ticket.